My daughter, Sami, has been using the Moseley style prosthetic. We've been very happy with it, but I am wondering if anyone else has used this design and if you had any problems with it. Functionally it works great...but, some cosmetic issues have been a problem...like finding pants~ we live in Ohio and it gets pretty cold. I'd love to hear from others experience. Thanks! I attached a picture of what the prosthetic looks like. 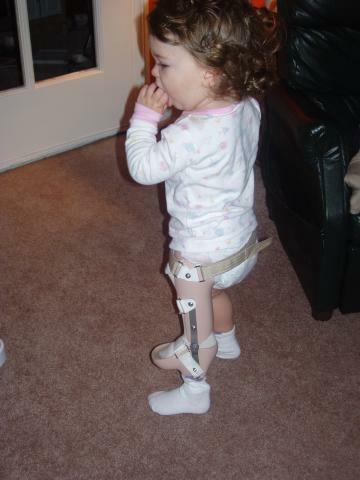 We've been using a similar prosthesis for our daughter (now 3.5 yrs old). We love it and are in Wisconsin where it also gets cold. We went with a prostheticist who works with carbon fiber so it is extremely light. Our daughter jumps like crazy in it. To keep her foot warm in the outdoor winter - we just put a knitted shoe over her foot. Its like a mitten, but there is a strap that goes around the back of her ankle and velcros to itself. I'm sorry that I haven't written back...I just noticed that there was a comment. I'm glad to hear some positive feedback. With your daughter about a year ahead of Sami, have you had any issues with pants fitting over the real foot? Also, is she getting much rotation in the ankle...the real ankle?? I like the idea of carbon fiber. I have nothing to compare Sami's to, but her ortho said that it was heavy. Also, has your daughter had any pain. Sami has had pressure bruises, a few have even opened up. This caused her to be off "her leg" for a few days. It doesn't stop her, but, I know she loves walking around better. If your daughter is getting bruises like that then you should think about going to a different protheticist or perhaps an orthoticist. We had similar issues with our first prosthesis and looking at your picture - it looks very similar to the one we first had. We also had giant nasty bruises and usually within an hour or so of wearing it. The problem was the design and the prostheticist. I wrote about our first few prosthesis at http://www.pffd.org/node/160. The main thing was that the prostheticist had lots of experience with removing weight from the bones and putting that on the skin. He cast the leg all the way up to the hip and the prosthesis was a snug fit all the way up like he was working with an amputee. Whew - what bad memories that brings back. We ended up switching providers (Noel Chladek) and its been wonderful. Instead of a device designed to bear weight on the skin, it puts the weight on the bones. We've been told its called a "prosthosis" a combination of prothesis and orthosis. One big difference is that the old prostheticist would say "Some bruising is normal." Noel says "There should be no redness still there after a few minutes with the lift off." When we go in for a fitting after a while of our daughter running around, kicking balls, climbing stairs, etc. Noel will look for red marks and then grind, pad, re-adjust the prosthosis accordingly. We have no bruising or skin changes at all until she starts to outgrow the prosthosis (Usually in 3-4 months). 2) We use nylon ankles, not metal. The design is similar to an AFO (Ankle-Foot-Orthosis) with a skate at the bottom. You don't have to go to a prostheticist for it, an orthoticist can do it. 3) We don't use the "Pedio-foot" or whatever it is called. We use a "skate" which is much ligher weight and fits in shoes just as easily. I recall the first protheticist insisting that it was needed, and as new to the world of prosthetics, we just accepted it. In retrospect - it was not needed. It was heavy. It added a lot to the bill. When we went to a physiarist the doctor confirmed that the skate would have been fine. Pants fitting over the real foot: We just have the pants come down to the ankle and leave it there. On many toddler pants it is easy to get them to go all the way down since many are designed for fussy todlers, but our daughter prefers to keep the pants stopping at above the ankle. I think it is because it helps with climbing to have the extra foot (e.g. the "rock walls" that some playgounds have), but it also makes it easier to get in and out of shopping cart seats. In winter we velcro a "boot mitten" over the foot. Its similar to the ones that snowboarders put over their snow boots for extra warmth. We have no rotation in the ankle. When she runs she inverts a bit to swing the foot through faster, but standing is normal. One thing I should mention is that our daughter's pffd leg is unaffected from the knee on down so it is well formed to support the weight on the foot, ankle, tibia, etc. Thanks so much for your response. I printed it out and I am going to send it to the prosthetisist. He's really good, it's just all new. He sees the value in the design...I really believe he'll gladly accept suggestions. If not, we'll look elsewhere. When I told him I was going to look for advice, he said, "That's great, that's what I'd do if it were my own child." I appreciate you're time and openess. It sounds like your niece will be getting rotationplasty done on her leg. Here is a link to some info: http://www.pffd.org/node/93. My daughter has pffd also in her right leg". she just turned 5. she will soon have the surgery". where they twist the ankle, its called rotationalplasty" i went on youtube and found a little girl like my daughter"
whos already had the surgery, so i know what to expect"... her name is tori.shes a wonderful strong little girl"..
if it helps look her up". her daddy recorder her step by step".. before the surgery and after".i feel confident evrything will turn out fine".. they can still walk around on their little leg with the rotatinalplasty"..
HI" SAMISMOM" PROSTHESIS looks good" its like the one my daughter has". but its not mosely. i will sure look into it". thank you"..
in the begging i had problem too findin pants for her".. but we got use to it and would just roll em up" and have the foot stick out".i tried loading a picture" but im new in here so i dont know how"..
What was the difference in your little ones legs? Did she have any hip problems?